I finally got around to finishing my honey's Father's Day card, and I like the way it turned out! I started with a design in mind, and actually stuck with it (minus the patterned paper); but I have to say I can't live without my Gypsy (I heart my G!!). I designed the whole thing at different times of the day when my baby boy was sleeping, then plugged it in, cut and assembled it. I was so excited I was almost done, that I forgot to run the golf ball through my cuttlebug, but oh well! I hope daddy likes his card! 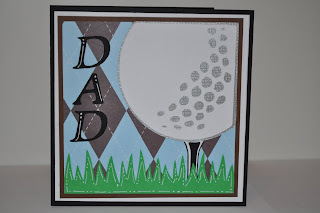 This is a "TEE"rific Dads card!!! found you on the MB blog hop...LOVE this card. Did you stamp the argyle print on that?